When I reached the kitchen door I remembered to put a few dippers full of clean water in the wash pan by the door so we could wash our hands before breakfast. After placing the pail of water on a small table in the corner of the kitchen, Mama told me to go to the house and wake my younger brother and sister. Within the next hour the whole family was seated at the table for breakfast. As Papa was saying grace, I remembered it was Sunday and I had a full day to play and do as I wished. Sunday at our home always meant a day of rest, for Papa did not believe in working on the Lord’s day. As we were eating, Papa reminded me that I had not greased the windlass as I was told to do the day before. He said it must be done in the morning or I would certainly be punished. I promised I would not forget this time. After breakfast Papa went to the barn to hitch up the horses to the wagon so we could all make the half-hour trip to church for Sunday services. I begged Mama to let me stay home from church because I had something I wished to do. It took a lot of pleading, and she finally agreed to let me stay home, but only if my brother and sister stayed and I would agree to watch after them. What I had planned was an exciting day of bow and arrow fishing in the creek down behind the house. This was one of my favorite pastimes, and with all the chores around the farm, Sunday’s were the only free time I had. After Mama and Papa left for church, I gathered up my bow and arrow, my brother and sister, and off to the creek we ran. Little Meadow Creek, as it was called, was not a very big creek. The deepest part of it was only about two feet deep, with most of it only six to eight inches deep. We quietly slipped along the creek bank searching for fish to shoot with my bow and arrow. With my little brother, it was almost impossible to sneak up on a fish that was lying still in the shallow water of the creek. Twice he slipped from the edge of the creek bank into the water, making enough noise to scare the fish a mile away. After hours of shooting at fish that always seemed to be moving and that I always missed, we finally came upon a big ole catfish lying real still on the bottom of the creek bed. This was one I was sure I would not miss. As I pulled back the arrow on my bow and took careful aim, my sister began hollering, “Shoot Conrad, Shoot!.” As she was shouting for me to shoot, she poked me in the back causing me to shoot before I was ready. As I watched, the arrow entered the water and slid across the back of the big ole catfish; he swam quickly away unharmed. I was so mad I felt like pushing her into the creek, but knew if I did she would tell Papa and he would give me the licking of my life. I waded into the creek to get my arrow and as I reached down to get it I saw a large yellow rock laying to the side of where my arrow struck. I handed the arrow to my sister, reached back into the water, and grabbed hold of the strange looking rock. I was surprised that it was so heavy to be so small. It was about the size of one of my shoes, but it seemed to weigh as much as the pail of water I had carried earlier that morning. In the 1870s the ground between Little Meadow Creek and Yellow Branch was grown up with field pines of mine timber size. The ground east of Yellow Branch was heavily wooded with oak and pine. Co.; reconnaissance of area, shafts, and tunnels. My brother, sister, and I were all excited as we hurried back to the house carrying the strange yellow rock that I had found. As we neared the house, we saw Mama and Papa coming down the old roadbed in the wagon. We ran down to meet them shouting all the way about what we had found. Papa took the rock from my hands and commented on how heavy it was and how it was such a pretty bright yellow. As he handed the rock back to me, he said it must be some kind of metal, but didn’t know what kind it was. Papa said, “Come let’s go home,” so we climbed onto the back of the wagon and headed back to the house with my odd-looking rock beside me. Later on, Papa took my rock with him to the nearby town of Concord where he visited the local silversmith to see if he might know what the rock was. The silversmith, knowing only about silver, couldn’t explain what the rock was and said it was probably worthless. When Papa returned from his trip he told us what the silversmith had told him and the rock was laid aside. This was the year 1799, and for the following three years my strange rock became a very useful item. It made a wonderful doorstop! In 1802, Papa had to make a long trip to Fayetteville, North Carolina on business and along with him he carried the family doorstop. I guess Papa never was satisfied with what the silversmith had told him. There in Fayetteville a jeweler identified the rock as pure gold. Not knowing much about gold, or its value, Papa agreed to sell it to the jeweler. The price they settled on was three dollars and fifty cents. Later on, after arriving back home, Papa discovered he had been cheated. Word had reached him that the jeweler had sold the gold for much more than he had paid Papa, several thousand dollars more! With much anger, Papa traveled back to Fayetteville to confront the jeweler. I never was told exactly what happened, or what was said to the jeweler, but I do know that Papa returned with a whole lot of money. Papa asked me to show him exactly where I found the gold nugget in the creek. When I showed Papa where I had found the nugget, we began to search for more. We found many more! In less than one hour, just by picking nuggets off the creek bottom, where the bedrock was shallow, Papa filled a quart jar. Later Papa and three friends, with the help of a few slaves, began working the creek together, finding many more nuggets ranging from pebble size, up to sixteen pounds. In the year 1802, one of the slaves named Peter was digging in the edge of the bank beside the creek when he uncovered the largest nugget ever to be found on our farm. It weighed a whopping twenty-eight pounds. At the time, little did I know that by finding the strange yellow rock, I had created the first gold rush in America and It would also become one of North Carolina’s greatest moments in history. 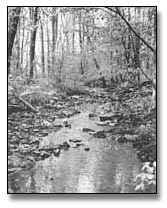 As news spread of the discovery of gold on the John Reed farm, many of the farmers in the area and nearby counties began searching their own creeks and streams for gold. Many were rewarded handsomely for their search and many new discoveries were made. At this time, no one knew exactly where the gold came from; all that was known was it could be found on the creek bottoms and along the edges of the creeks. 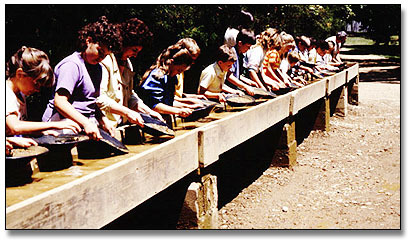 This type of mining was called placer mining, and for many years was the only type of mining to be done. In 1825, while panning in the creek that ran through his small farm in Stanley County, North Carolina, Tobias Barringer made a new and great discovery. As he was panning along his stream, finding a few flakes of gold and once in a while a small nugget, he came to a spot where the gold ran out completely. Confused about why this happened so suddenly, he noticed a bunch of white rock protruding from the creek bank right about where the gold ran out. Out of curiosity, he dug his pick into the mass of rock and was surprised when he uncovered a pocket of gold, most of it still imbedded in the white rock. On that day alone, he dug almost fifteen hundred pennyweights of gold from that one pocket This was the beginning of lode mining in North Carolina, new gold discoveries, and the opening of many new mines in the state. It wasn’t until 1831 that the gold rich veins were discovered on the John Reed property. In 1896, the last big nugget was found on the Reed property by John Reed’s great grandson, Jake Shinn. The nugget weighed twenty-three pounds. Mining flourished in North Carolina for many years and made many men wealthier than they ever dreamed possible, but for many reasons it finally died out. About all that is left of mining for gold in North Carolina is its history and the many old pits and shafts that dot the hillsides and the valleys of this great State. Once in a while one might see a lone prospector wading through the creeks with pan and shovel in hand still searching, hoping, and dreaming that he will be the next one to make a big gold strike in the state we love so much, NORTH CAROLINA. In 1971, the State of North Carolina purchased the Reed property. It is now a state historical site. The State constructed a large museum which houses many relics and mining equipment from the Reed and other mines in the surrounding area. As one enters the museum, it seems as though one has traveled back into time to the days when gold mining was a big business in North Carolina. At the beginning, one will be shown a thirty minute film with actors playing out the discovery of gold at the Reed Mine, and the events of gold mining in the area. 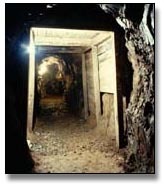 After a walk through the museum, seeing actual gold nuggets and gold ore found at the Reed Mine and other mines in the surrounding area, and looking over the type of equipment used in the early days of mining, one will be taken on a guided tour through the old tunnels andworkings of the mine. On these trails, one will see many more diggings and much of the old equipment used at the mine in those days. There is no cost to visit the Reed mine and for anyone visiting North Carolina and wanting to learn more about the history of gold mining in this state I highly recommend visiting the Reed Gold Mine.